Baan Suay Mai Ngam. 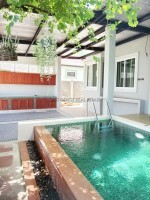 This clean, tidy 3 bedroom private pool villa is located in a quiet village just off of the Sukhumvit Road. Jomtien beach, Pattaya City and other amenities are just a few minutes drive away. The home has been furnished to a good standard with quality furniture, fully fitted European kitchen with hood, hob, oven, fridge/ freezer and microwave, open plan living/ dining area with access to the swimming pool plus jacuzzi which is situated at the rear of the property allowing privacy. There are 2 air conditioned bedrooms with both having en-suite bathroom. The 3rd bedroom is currently used as an office but does not have any air condition installed. There is also a 3rd bathroom with bathtub for common use in the house. The home has covered parking available for 2 cars, medium size garden and remote control gate.